Not the normal Sunday lunch conversation to be had whilst you are all tucking into a lovely roast dinner and it may cause some indigestion around the table!! but maybe one that you should be having? From times beginning one thing we can ALL be sure of is that we will “Shuffle of this mortal coil” at some point, some sadly sooner than others, but it’s something that we can’t avoid. Death does seem to be a bit of a taboo subject within the UK, but now more and more families are making it a talking point rather than something that is brushed to one side. Your burial options now are far wider than they ever used to be. 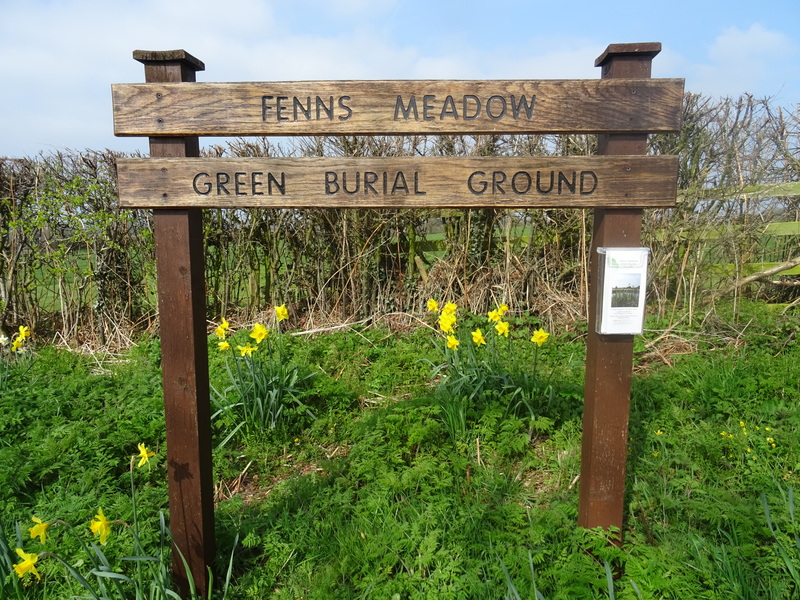 One environmentally friendly concept is having a Green Burial and here at Fenns Meadow Green Burial Ground, which is based just outside Whitchurch, Shropshire, we are seeing more and more families coming to us and discussing their plans for their burial and also their parent’s burial. Green Burials-or natural burials are becoming more common as families become more environmentally aware. They allow the body to recycle naturally by being buried in a beautifully woven wicker coffin or a jazzy cardboard coffin. There are weavers who make shrouds from sheep’s wool that are so soft and delicate, they are incredible pieces of craft work. All of these materials are bio-degradable sending everything back into the earth, just as it used to be pre- Victorian times. The connection with nature also extends to the grave after the burial, we encourage the family to bring wild flower seeds either from their own gardens or some that are bought and leave them with us. Then we will scatter these onto the soil when it has been returned, giving it, its own unique plethora of wild flowers. We don’t have headstones, we just have small wooden markers and that is the biggest difference between a traditional church yard burial and one in a green burial site. The idea is that the landscape keeps its structure as a meadow land and not a stone filled grave yard. Our burial ground covers all religions and beliefs, from agnostic to Christian, everyone is welcome. The ground itself is not consecrated, however your grave can be blessed prior to burial. Every burial we have had has been unique to that individual. We pride ourselves on giving a very personal service, none of this 20 minutes and “exit via this door please”. Your burial here and at most Green burial sites, is given time and space for the families to say good bye to their loved ones in their own way, without feeling time pressured. A lesson to us all in the UK, was from one family that came to us, whose Mother had pre- arranged her Green burial, but had not communicated her wishes to her two daughters. Her daughters were surprised that she had chosen this way to be buried as they had never discussed it and had just presumed she would be buried in the local churchyard with a headstone. After visiting the site and enjoying the tranquillity, peacefulness and incredible views they both came to understand her decision. However, this was after her death and not during her life. How simple it would have been to have passed the roast potatoes and inform her daughters of her burial wishes. A lesson to us all.